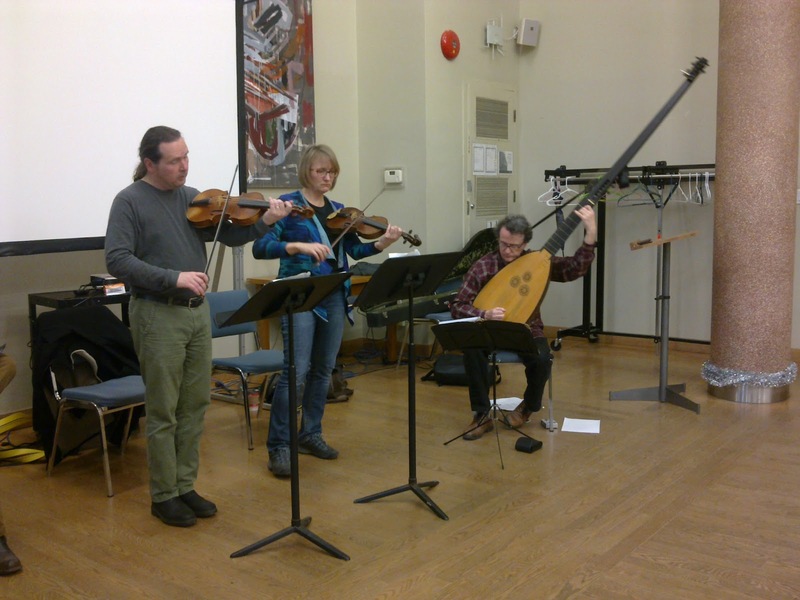 Lecture 7:30 p.m., Concert 8 p.m.
Named after the singers and lutenists who performed in the most intimate quarters of the Stuart monarchs’ palace, The Musicians In Ordinary for the Lutes and Voices dedicate themselves to the performance of early solo song and vocal chamber music. Soprano Hallie Fishel and lutenist John Edwards have been described as “winning performers of winning music.” A fixture on the Toronto early music scene for over 10 years, in 2012 MIO became Ensemble in Residence at St. Michael’s College in the University of Toronto. They have concertized across North America and lecture regularly at universities and museums. Institutions where MIO have performed range from the scholarly to those for a more general public and include the Shakespeare Society of America, the Renaissance Society of America, the Shakespeare Association of America, Grinnell College, the Universities of Alberta, Toronto and at California at San Diego, the Kingston Opera Guild, Syracuse, Trent and York Universities and the Bata Shoe Museum. They have been Ensemble in Residence at Lafayette College in Easton, Pennsylvania. Praised for her ‘mellifluous yet clear’ singing (James Young, Music in Victoria), mezzo-soprano Rebecca Claborn has performed with a wide array of ensembles and conductors throughout North America. A graduate of the University of New Hampshire and the University of Alberta, Rebecca also studied at the University of Toronto, the Victoria Conservatory of Music, the Tafelmusik Baroque Summer Institute, and the Franz Schubert Institut in Austria. She has been a featured soloist with Edmonton’s Richard Eaton Singers, the Alberta Baroque Ensemble, the Victoria Baroque Players, the Ottawa Bach Choir, the Victoria Choral Society, the University of New Hampshire Concert Choir, the Pacific Baroque Orchestra, and the Theatre of Early Music, appearing on their recent releases on the Analekta label: The Heart’s Refuge (2014) and The Vale of Tears (2015). Ben Kim is a composer and tenor based in Toronto. Originally hailing from Geoje, South Korea, he grew up playing the piano. It wasn’t until he joined a choir at the age of 20 that he started singing in earnest. As a singer, he has performed with various amateur and professional groups from the US and Canada. Currently, he is a member of St. James Cathedral Choir. As a composer, his music has been appreciated and performed throughout the world by many musicians and ensembles. Notably, his choral arrangement of a Korean folk song called Hangangsu Taryeong – a “dissonant tone painting,” as one reviewer put it – was performed in Disney Hall by LA Master Chorale. His music is often described as eclectic or prismatic. He is published by Renforth Music in Canada, and earthsongs in the US. Graham Robinson is a bass-baritone hailing from Vancouver Island, British Columbia. Receiving his Bachelors of Music in Voice at the University of Victoria, Graham was a much sought after soloist during his time in B.C. Now based in Toronto, he has been featured with the Elmer Iseler Singers, Tafelmusik, La Chapelle de Québec, the Elora Festival Singers, the Nathaniel Dett Chorale as well as many others. Graham is a devoted supporter and patron of aesthetics who strongly believes that creativity will take us anywhere we want to go. ‘Putting one’s soul into any discipline is art. It is in those times one learns to fly.’ When not making music Graham further extends his passion for the arts community through film and videography. Bass-Baritone Joel Allison is currently pursuing an Opera Diploma at the University of Toronto under the tutelage of Daniel Taylor. He is a core member of the Tafelmusik Chamber Choir, and also performs with the Theatre of Early Music and is the bass lead at Trinity St. Paul's United Church. 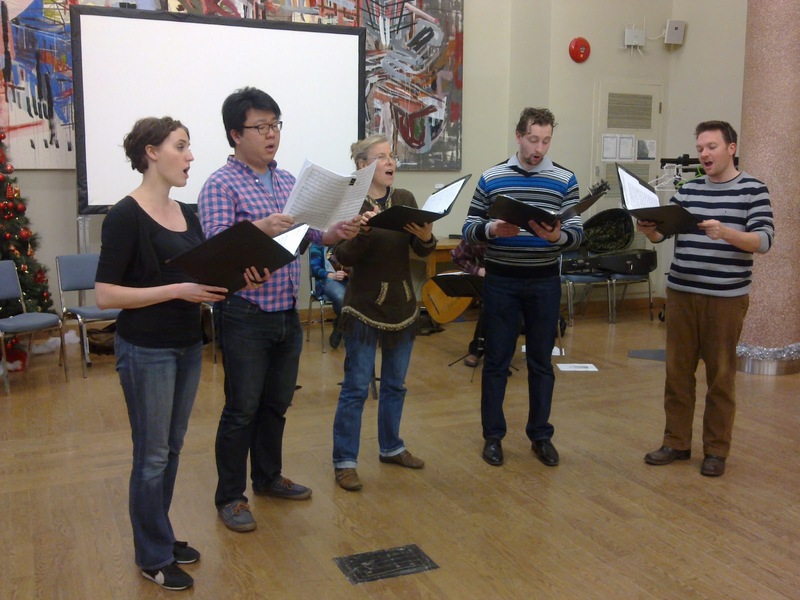 He has appeared as a soloist with many Canadian Ensembles including, the Peterbourgh Singers, Talisker Players, and Seventeen Voyces Chamber Choir. Joel performs regularly in both opera and concert. Roles include; the title role in the opera Don Quixote by George Telemann, Lepporello in Mozart's Don Giovanni, Don Alfonso and Guglielmo in Mozart's Cosi Fan Tutte, Aeneas in Purcell's Dido and Aeneas. 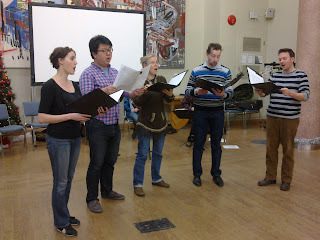 Upcoming performances include the role of John Shears in Paul Bunyan by Benjamin Britten at the University of Toronto. 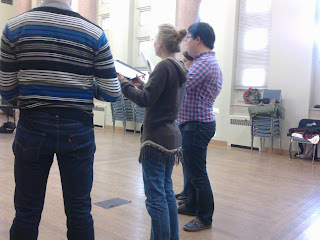 Joel has a BMus in Vocal Performance from the University of Ottawa. Christopher Verrette has been a member of the violin section of Tafelmusik since 1993 and is a frequent soloist and leader with the orchestra. He holds a Bachelor of Music and a Performer’s Certificate from Indiana University. He contributed to the development of early music in the American Midwest, as a founding member of the Chicago Baroque Ensemble and Ensemble Voltaire, and as a guest director with the Indianapolis Baroque Orchestra. He collaborates with many ensembles around North America, performing music from seven centuries on violin, viola, rebec, vielle, and viola d’amore. He was concertmaster in a recording of rarely heard classical symphonies for an anthology by Indiana University Press and recently collaborated with Sylvia Tyson on the companion recording to her novel, Joyner’s Dream. Patricia Ahern has a BA and BMus from Northwestern University, MMus from Indiana University, and performer diploma from the Schola Cantorum in Basel, Switzerland. She has taught baroque violin at the Freiburg Conservatory and Oberlin’s Baroque Performance Institute, and given masterclasses at McGill, Wilfrid Laurier, York and Grand Valley State Universities, and the Universities of Windsor, Wisconsin and Toronto. She has concertized on five continents performing with Milwaukee Baroque, Ars Antigua, Chicago Opera Theater, Kingsbury Ensemble, Aradia, I Furiosi, Newberry Consort, Musica Pacifica, and the Carmel Bach Festival. Tricia has recorded for Sony, Naxos, and Analekta, and joined Tafelmusik in 2002. Alexandra Guerson is a lecturer at the International Foundation Program, at New College, University of Toronto where she teaches world history. She received her PhD from the University of Toronto, defending a dissertation entitled Coping with Crises: Christian-Jewish relations in Catalonia and Aragon, 1380-1391. She has won major research grants from the Federal, Ontario and Quebec governments and her research has been published in journals such as Jewish History and Sefarad. Her new research project, a collaboration with Dana Wessell Lightfoot, deals with Jewish women in Catalonia in the aftermath of anti-Jewish violence in 1391 and is funded by a SSHRC Insight grant. 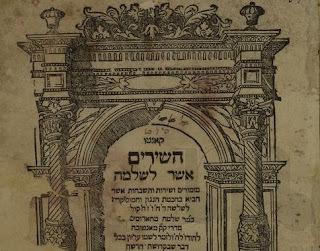 Rossi had already published seven books of madrigals and other Italian vocal music and four books of instrumental music when he saw his collection of Hebrew music for three to eight voices with the proud title Hashirim asher liSholomo, ‘Songs of Solomon’, through the presses in Venice in 1622-3. This book (which actually contains no texts from the Song of Solomon) is the first collection of polyphonic Hebrew music, but it is much more than that. 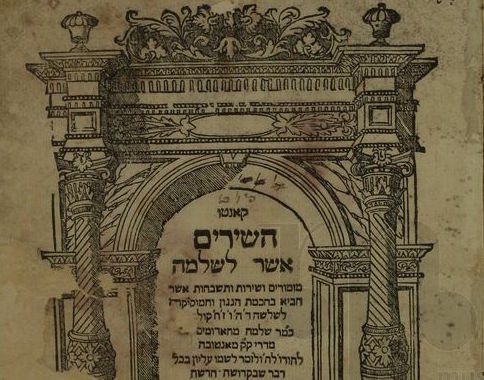 The copious prefatory material includes a discussion of whether concerted, measured ‘art’ music had a place in the synagogue in an ‘opinion’ by Rabbi Leon Modena and responses thereto. So, since it seems to have still been a matter of contention, whether the Songs were heard in synagogue, study hall or private homes is not known. Perhaps the private synagogue, of the type prominent Jews of the time maintained, in the household of the dedicatee and Rossi’s patron, Moses Sullam, was the scene for the performance of these pieces. Perhaps they were heard as sacred chamber music in other rooms. But, though tonight you hear only Psalm settings, prayers with congregational and cantorial responses are included, perhaps less suited for public performance or private devotion. Would women have been heard singing upper parts in the synagogue? Castrati? Boys? Did Rossi’s sister, a successful early opera singer, take part? Beside Sullam, Rossi’s main patron was the Duke of Mantua, at whose court he worked as a violin player and possibly as a singer. The dance floor had been the violin’s main haunt for most of the 16th century and indeed, even before the violin’s development, Gugliemo Hebreo della Viola had been Marchesa of Mantua, Isabella d’Este’s dance master. Though you will hear some of Rossi’s dance music, you will also hear, especially in the sonatas Moderna and Viena, the violin being emancipated from the dance. Rossi specifies ‘chitarrone (more often called ‘theorbo’) ‘or other similar instrument’ as the bass. Sonatas for two violins and a bass, through Corelli to Handel and beyond, have their antecedents in Rossi’s books of instrumental music. Rossi went for many years without a pay raise at the ducal court and it has been suggested this might have been prejudice at work. He seems to have been from a fairly successful merchant family, though, and used his court connections to obtain licenses and patronage for his family’s business, so perhaps he didn’t need the money. His sister, ‘Madama Europa’ as she was known, didn’t encounter any obstacles in her spectacular career as a court and early opera singer and Rossi was exempted from wearing the badge marking him out as a Jew. He is last heard of in Venice in 1628, putting another publication through the presses. 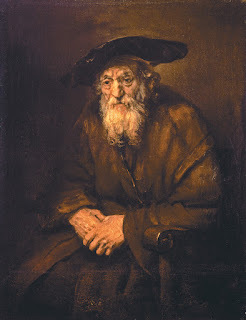 It’s unknown if he stayed on quietly in Venice, or went back to Mantua and died in 1630 in the destruction of the Jewish ghetto when Imperial troops invaded, or perished in the plague that ensued. In the typically hyperbolic commendatory poetry in the prefaces to the Songs Rossi is compared, not to Orpheus, as musicians usually are in such places, but to King David, author of the psalms who also ‘danced before the Lord with all his might.’ I wonder if he danced a galliard, a correnta or one of our ground basses. A song of degrees. Blessed are all who fear the Lord: they walk in His ways. The labour of your hands will you eat; blessed will you be and all will be well with you. Your wife will be like a fertile vine in the recesses of your house; your sons will be like olive shoots around your table. Thus, indeed, will the man be blessed who fears the Lord. May the Lord bless you out of Zion, and may you see the good of Jerusalem, all the days of your life. May you see the sons of your sons; peace unto Israel! By the rivers of Babylon, there we sat and wept remembering Zion. On willows in its midst we hung our lyres, for there we were asked by our captors and by our oppressors to make merry: ‘sing us a song of Zion.’ How can we sing the song of the Lord in a foreign land? If I forget you, Jerusalem, let my right hand forget itself. Let my tongue stick to its palate if I do not remember you, if I do not raise Jerusalem to the summit of my joy. Remember, Lord, the sons of Edom, in the day of Jerusalem; they said ‘raze it, raze it to its foundations!’ Daughter of Babylon to be ravaged, blessed be he who repays you in the coin you paid us. Blessed be he who grasps and smashes your babes against the rocks. For the chief musician, on the gittit; a psalm of David. Lord, our Lord, how mighty is your name throughout the earth, for You placed Your glory over the heavens. From the mouth of babes and sucklings You ordained the strength, because of Your enemies. to stop the adversary and the avenger. When I see Your heavens, the work of Your fingers, the moon and stars that You established, what is man that You should remember him and a mortal that You should care for him? You placed him a little below the angels; with honour and esteem You adorn him. You made him rule over the works of Your hands; everything You set under his feet: sheep and oxen, all these, as well as beasts of the field; birds of the skies and fish of the sea; whatever crosses the path of the seas. Lord, our Lord. how mighty is Your name throughout all the earth! A psalm for thanksgiving Cheer the Lord all the earth. Worship the Lord with Joy; come before him in song. Know that the Lord is God; He made us, and not we, His people and the flock of His pasture. Come into His gates with thanksgiving, into His courts with praise; thank Him, bless His name, for the Lord is good, everlasting his mercy and for all generations is His faith. God, restore us; brighten your face and we shall be saved. God of hosts, restore us; brighten your face and we shall be saved. Lord God of hosts, restore us; brighten your face and we shall be saved. A psalm of Asaph. God stands in the congregation of the godly; among the Gods will He judge. How long will you judge wrongly and the wicked favour? Selah. Judge the needy and the orphaned; to the poor and the destitute be just. Release the needy and deprived; from the hand of the wicked save them. They neither know or understand, in darkness they walk; down come all the foundations of the earth. I said: ‘gods you are. and the songs of the Highest One, all of you. Yet as men you will die and as one of the rulers you will fall.’ Rise, God, judge the earth, for you own the nations. A song of degrees. When led by the Lord to return to Zion, we were like dreamers. Then our mouth filled with laughter and our tongues with song: then we said among the nations: ‘great things did the Lord do for them.’ Great things did the Lord do for us; we were happy. Return us, Lord, from our captivity, like streams in the Negev. Those who sow in tears, in song will reap. He who goes about weeping, holding a bag of seed, will come back singing, holding his sheaves.